Bringing your vision to life may seem daunting, until you visit one of our showrooms. Our consultants will work with you one-on-one, giving you the personal attention you need (and deserve) to bring your kitchen and bathroom design to life. 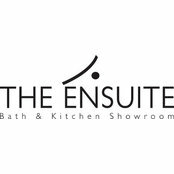 Our showrooms give you the opportunity to touch, feel and experience a new bathroom and kitchen at your leisure. We know your style is unique and we can’t wait to help you make your space a true reflection of you. 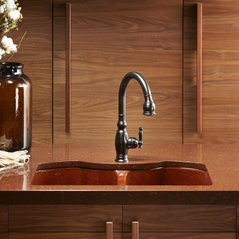 We work with your tastes and budget to make your bathroom & kitchen designs come to life. Not sure where to begin? 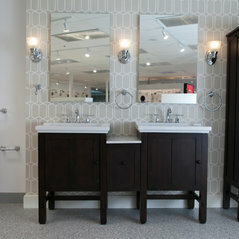 Visit one of our showrooms to get the inspiration you need to take the guesswork out of this major project. Satisfying individual needs and desires is what we do, everyday. Go ahead…try us! Commented: love bead board colour - what is the colour ?Hi Whiteruud, Thanks for the question! 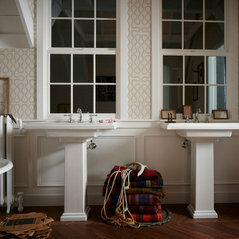 The colour of the beadboard is Benjamin Moore's "Iceberg - 2122-50". Product/Sheen: Aura Interior, Matte. Commented: What is the wall colour?The wall colour is Benjamin Moore's "Gray Mirage" (Code 2142-50). Product/Sheen: Aura Bath &amp; Spa, Matte. Thanks for asking!